As you all know, I’ve been depressed now for several months…deeply depressed. If I had a friend in the mental place I’ve occupied these months, I’d be very concerned for them – as many of you have been for me, which I appreciate. Ultimately, the decision to fight this condition is mine alone. I’ve made a few attempts to pull out of the whirlpool pulling me under; but, none of them have been consistent enough or thorough enough to make a difference. As a result, the whirlpool has become stronger – stronger to the point that I’ve found myself shaking my fists at the sky asking if I could get a break already. The answer, if there has been one, was apparently “no.” The latest set-back has been largely my own fault, though. My workplace is germier than any kindergarten in the world. Hourly employees who live from paycheck to paycheck go to work when they’re sick. They don’t have a choice. I know. I haven’t missed a shift, either, in spite of the lung cooties I’ve got going on right now. It’s not my fault that I work with Typhoid Mary. It is my fault that my immune system was compromised. In my depression, I failed to do some things I’ve advised you to do over and over again – exercise, eat nutritious foods and balanced meals. I have not given my body the nutrients it needs to defend or fight for itself. 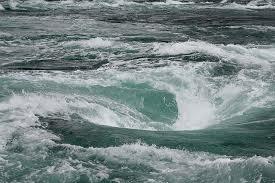 As I said, the decision to pull out of the whirlpool is mine. The first step to that was to go grocery shopping. This week, I went to Aldi and came away with all kinds of vegetables, eggs and nutritious snacks. I’ve already begun feeding my body what it needs to heal itself. It’s just the first step; but, I’ve taken it. After a few days, I’ll take another. One at a time. This entry was posted in Food, Thought Patterns. Bookmark the permalink. Please know that I am praying for you!! I am sorry life is so difficult right now but I know you and your determination and you will rise up from this a better person because of it. I love you and am thinking of you. Call if you need to talk. Thanks, Karen. It’s humbling to hear that from you today as you go through this particularly sad holiday yourself.